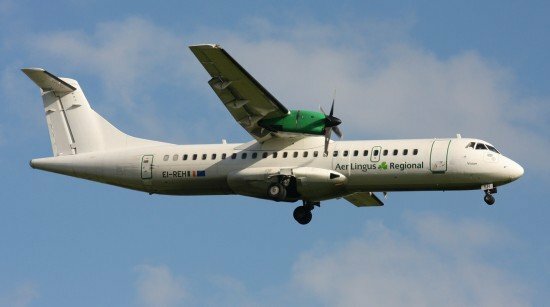 An ATR-72 of Aer Arann was involved in a bounced landing incident in crosswind conditions at Cork Airport, Ireland. The commander was not yet qualified to land on a shorter runway with better wind parameters. On May 12, 2013, the ATR-72 operated on a service from Manchester, UK to Cork, Ireland with 47 passengers and 4 crew members on board. The Commander, who was Pilot Flying (PF), had been upgraded to captain on 5 May 2012. As a new captain, his crosswind limit was reduced by 5 kts from the operator’s maximum crosswind limit for a dry runway of 30 kts. Also, he had not been checked out for runway 25 at Cork which, at a length of 1,310 m, was classified by the operator as a short runway and required particular qualification. Surface winds at Cork were reported to be fro 240 degrees at 15 knots, maximum 27, minimum 7 knots. The crew discussed the surface wind and calculated that the peak crosswind component was 25 kts from the right. The crew started the ILS approach to runway 17 and received updated wind information with a new maximum of 23 knots. During the landing, initial contact with the runway surface was on the main landing gear wheels with a nose up pitch attitude. The aircraft bounced slightly and simultaneously pitched down sharply. The second contact with the runway was solely on the nose wheels. A maximum vertical acceleration value of 1.707g was recorded. The Commander immediately initiated a go-around and thereafter a normal approach and landing was made on runway 17. Subsequently, the nose landing gear was withdrawn from service since the certification basis and design criteria did not foresee such an occurrence. Inadequate control of aircraft pitch in the flare during a crosswind landing in gusty and turbulent conditions. 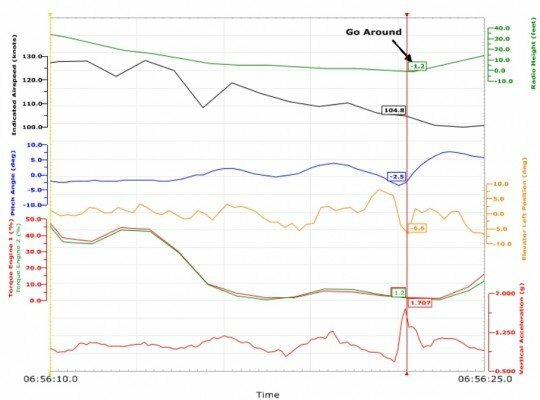 The average approach speed exceeded the calculated VAPP by approximately 5 kts which, when combined with the gusts experienced during the flare, may have contributed to the bounce. An operational restriction on the Commander meant that he could not make an approach to RWY 25, which had a significantly lower crosswind component than that experienced on RWY 17.